I was baptised Patrick Heaney in St Patrick’s Church on St Patrick’s Day, 1974. That possibly explains the unassailable self-confidence I felt ahead of the St Patrick’s Day Road Race in Donegal. Early that morning as I paced around the bedroom gathering gear, I made a bold declaration to my half-sleeping wife. “I’m going to win this race today,” I announced. “Why do you say that?” asked Siân, curious as to why I was so insanely confident given it was only the second open race I’d ever entered. “Because it has my name written all over it,” I replied, half-joking but deadly serious (insanity is a huge advantage in cycling). I have no shame in admitting that the moment I glanced over my shoulder and looked down the road to discover I’d held off the chasing pack was one of the most thrilling experiences of my life. In that nanosecond, a cocktail of emotions all erupted simultaneously. It was a Big Bang explosion of euphoria and relief. While the rush lasted only a few seconds, the groundwork leading to the victory involved months of meticulous planning, consistent training and rigorous self-discipline. So, how is it done? 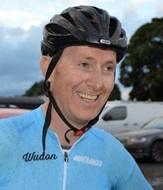 How does a 44-year-old gym owner emerge from the 1,395 registered A4 racers in Ireland to win a bike race? The following guide should provide a good starting point for any cyclist or athlete with similar aspirations. When I started serious structured training at the start of October 2017, I had a clearly established goal. I wanted to win an A4 Race. To achieve that ambition, I knew I had to lose weight while maintaining my strength. Suffice to say as a qualified personal trainer I was able to design my own nutrition plan which helped me lose body fat not muscle. I also drew up my own weight training programme which helped me maintain and develop strength without gaining size. I also followed a training plan for the bike. Spin classes in our gym, The Train Station, twice a week, then my friend and coach, Philip McGuigan provided my sessions for the road. At the start of every week I knew exactly what I’d be doing. Before entering the glorious world of racing, I was partial to a bit of KOM Hunting. As dogs mark out their territory by peeing on lampposts, the stereotypical KOM Hunter likes to identify his terrain by taking the Strava segments near his home. (Confession: I am a stereotypical KOM Hunter). After claiming a KOM on a hill climb last summer, I managed to average 668 watts for nearly a minute. Truth be told, I was pretty chuffed with myself. My friend, Philip wasn’t just as impressed. Having devoured and digested Training and Racing with a Power Meter by Hunter Allen and Andrew Coggan, both Philip and I understand that cycling is basically a numbers game. 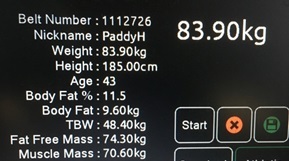 And Philip was quick to point out that while 668 watts was a decent power output it was offset by the fact that I weighed around 14.5st, giving me a power to weight ratio of approximately 7.08 (w/kg). According to Allen and Coggan’s Power Profile Chart, that made me a very ordinary Cat 4 cyclist. While the stats provided by the Power Profile chart were sobering, further calculations lifted my morale. By crunching a few numbers I could see that if I was able to generate the same wattage at 12.5st, I’d be a very good Cat 2 cyclist. That exchange with Philip really struck a chord. Anyone who has any experience of cycling will appreciate that progress is often slow and arduous. That said, for those of us who have a tendency to carry extra weight, the easiest and quickest way to get faster on the bike is to keep your big head out of the kitchen cupboards. (I say that with love). However, the big challenge for athletes is to lose body fat, not muscle, and by extension, strength and power. Following my own nutrition plan, I was able to calculate what I needed to eat in order to shed body fat while maintaining the ability to produce more than 650 watts for a minute. Initially, I set myself the short term target of losing 1lb per week while my long term objective was to reach 10 to 12% body fat. (Using the body composition monitor at the Train Station I was able to track my body fat percentage and muscle mass). Muscle mass deterioration begins in everyone at about 35 and accelerates every decade. The condition is known as age-related sarcopenia. Endurance training can actually worsen the effects of sacropenia. Long bouts of moderately paced, low-intensity rides force a release of hormones such as cortisol that work to break down muscle tissue. While withered muscles are one thing, your skeleton is another story. Anyone who only rides a bike and does no cross-training or weight training will be reducing their bone density and making themselves more vulnerable to osteoporosis. A seven-year study of male masters riders published in 2011 found that nearly 90% of subjects had osteoporosis or osteopenia, a far higher rate than the noncyclist control group¹. To counter this problem, the authors of the latter study recommended “coaches working with cyclists need to promote alternative exercises such as weight training, plyometrics, or other high impact activity to help minimize bone loss in this population”. Weights can cause significant changes in your body; improvements in strength and power, and more resistance to injuries due to the strengthening of bones and connective tissue. Weights also stop the catabolic effect of aerobic mono-training, and reverse the muscle mass deterioration that starts in everybody about age 35. Bottom line: weight training will keep you riding years longer, even decades longer, and increase your general quality of life. By working your muscles in the weights room rather than riding outdoors, researchers have discovered that weight training develops a superior type and quantity of muscle fibre that fatigue later in the race, giving you the much coveted sustainable power – the ability to hold form and speed throughout the race so you have something left in the tank for a strong finish. Weights will only make you bigger if you want to get bigger. Bodybuilders increase muscle mass by diet and hypertrophy training (lifting moderately heavy weights in a rep range of 8 to 15). 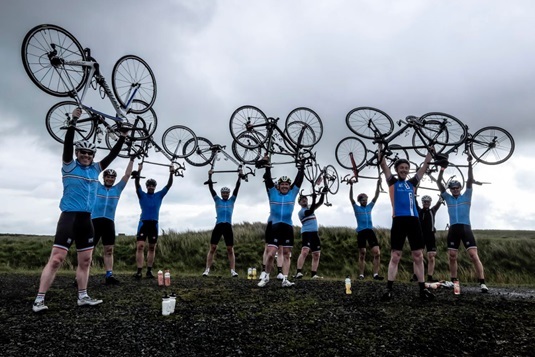 Power-to-weight athletes such as cyclists don’t want to add muscle mass or gain weight and they won’t if they follow a strength training programme (lifting heavy weights in a rep range of 1-6). 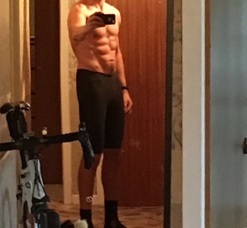 As discussed previously, as a cyclist with ambitions of winning a race, I realised that the quickest and easiest way for me to get faster on the bike was to lose weight. While I wanted to get lighter, I also wanted to keep my strength, thus maintaining the ability to produce the same wattage. Before deciding to race, I weighed 14.5st (92kg). For any competitive athlete, a standard benchmark of strength is the ability to deadlift double your bodyweight. At 92kg, I could deadlift 190kg. When designing my weight training programme, I set myself the goal of being able to lift the same weight at 13st (82.5kg) as I was lifting when I was 92kg. In the video above, I weigh 13st (82.5kg) and deadlift of 190kg is 2.25 times my bodyweight. ¹J.F. Nichols and M.J. Rauh, “Longitudinal Changes in Bone Mineral Density in Male Master Cyclists and Nonathletes,” Journal of Strength and Conditioning Research, vol 25, no.3 (March 2011): 727-34. 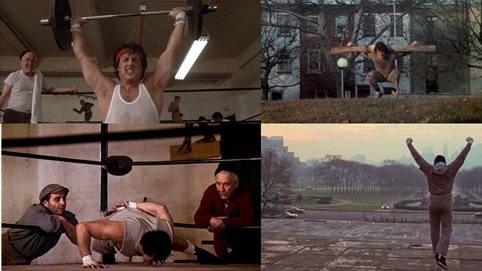 Everyone loves the Rocky training montages. They’re premium entertainment. After approximately three minutes of intense training and a few raw eggs, the plucky underdog, Rocky Balboa is ready to take on the heavyweight champion of the world. Of course, there is nothing inherently wrong with the Rocky films. The only problem with them is that people actually believe them. Obviously they don’t believe that peak condition can be achieved in a few minutes. However, embedded in the subconscious of many of us there is a deep-seated belief that fitness can be achieved quickly. And this is nonsense. When training clients, I often make the analogy that the journey to getting fit is the same as the journey to getting fat. No-one becomes fat overnight. It takes time. A pound here. A pound there. A quick diet before a holiday. Then put all the weight back on during the holiday. Return from holiday. More weight gain. Weeks turn into months and months turn into years and the reading on the scale goes from 11st to 12st to 13st. Please don’t think I’m preaching. I’ve been that soldier. I love training. But my weakness is food. In my early 20s, I was 11.5st. By my early 30s, I was touching 16st. Personal experience has informed me that getting fit is no different to getting fat. In the same way as it’s impossible to go from a beanpole to a button-buster in three months, it’s equally impossible to go from recreational cyclist to race winner in six weeks. Getting fit takes time, patience and perseverance. Moreover, the notion that every session needs to leave you crawling on the floor is also a total fallacy. The American strength and conditioning guru, Dan John, espouses a much more accurate philosophy which should be pinned on every athlete’s wall. When embarking on any training regime, the easiest part is the start when motivation levels are soaring. The hard part is when the novelty wears off. There will be days when you’re tired, days when your body aches, days when the weather is horrible, days when others things need to be done. Every second thought will be telling you to skip the session. Your excuses will be convincing. But at the moment you’re ready to succumb, remember Dan John and punch the clock. 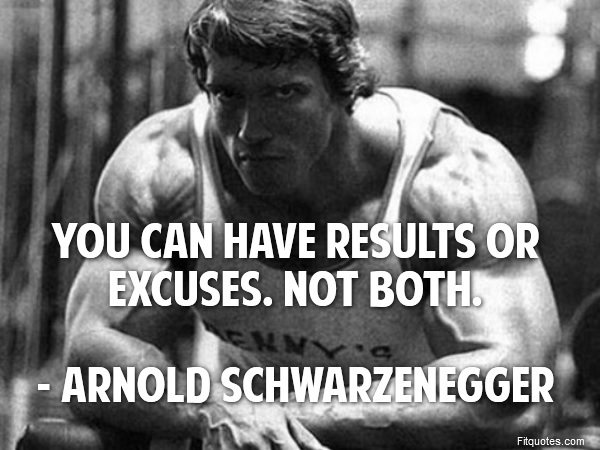 And if Dan John doesn’t work for you, try Arnie. The first person I ever trained was a cyclist. A good club cyclist, he wanted to try his hand at racing. I trained him. He was upgraded to A3 after three races. I continue to train cyclists. But as stated previously, I am coached by my friend, Philip who I’ve known since school. To some people, this might appear baffling. But to competitive cyclists, it will make sense. Why does someone who coaches cyclists get coached himself. The answer is simple. It’s incredibly difficult to train yourself properly. For example, when I started training in October, my motivation levels were through the roof. At that stage, Philip repeatedly had to caution me from doing too much. Over-training is a common mistake. Push yourself too often and too hard and you become fatigued – and that generates a myriad of problems. Power training in the weights room coupled with sprint training on the bike develops the ability to produce a strong finish. A good coach will know when you need to rein back the effort and advise rest. He will also know when to prescribe the pain sessions. And this is the other reason why a coach is so beneficial. Research has proved that polar-training is the most effective method for improving cyclists. Polar training basically means you train at two extremes. Either you train hard to improve power in Zone 4 (Lactate Threshold) and Zone 5 (VO2) or you train to improve endurance in Zone 2 (aerobic capacity). The phrase ‘Black Hole Training’ was coined for bike racers who get `sucked’ into spending the bulk of their training time in no-man’s land. The common pitfall of riding too hard during endurance sessions and not hard enough during high intensity workouts can be avoided by employing the services of a good coach. During the winter months, a lot of my high intensity work was done during the 10-week Turbo Spin programme we run at the Train Station. Most A4 bike races come down to a bunch finish, which means 1 minute and 5 minute power is essential. 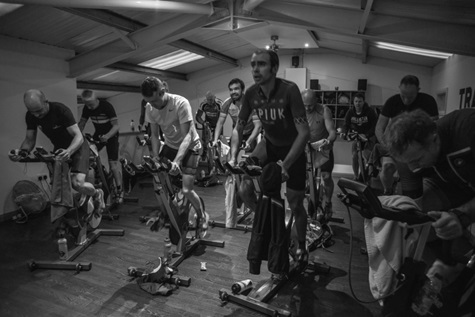 The overwhelming majority of Turbo Spin sessions focus on the development of 1 minute and 5 minute power. Spin classes at the Train Station focused on developing the 1 min and 5 min power range which is essential for producing a strong kick at the business end of a bike race. Two men agree to race each other in a wheelbarrow race. The have to push a wheelbarrow with 85kg of stones up a hill. Both men are the same age, height and weight. They’re both about one stone overweight, carrying approximately 20% body fat. The first race ends in a draw. They agree to a rematch. For the rematch, the two men are given a budget of £2000 and two options. For the first option, the £2000 will provide them with a personal trainer who will help them lose 5% body fat. The coach will also oversee a training programme which will improve their strength, power and sprinting. For the second option, the £2000 will provide them with an aerodynamic, carbon wheelbarrow, which weighs 1kg lighter than the aluminium alternative. Surely only an absolute idiot would squander £2000 on the marginal gains of a carbon wheelbarrow when they could enjoy massive gains from investing in a structured training programme? Hmmm! A lot of cyclists reading this blog will currently be blushing. For carbon wheelbarrow read carbon bike with £1,000 wheels, a £600 power-meter – and 20% body fat! Too often cyclists are seduced by the billion dollar bike industry which convinces them they can buy speed. Online bike magazines which rely on advertising revenue from the major bike companies provide a drip-feed of sleek products, all promising outrageous gains. But it’s just sophisticated marketing. Equipment provides only marginal gains. The massive gains are obtained from training the person sitting on the bike. Aspiring racers with a limited budget need to be smart. A cycling coach is a very prudent investment. A personal trainer can also reap major dividends. Huge progress can be made by getting stronger in the weights room and lighter on the bike. I spent a week in A4. 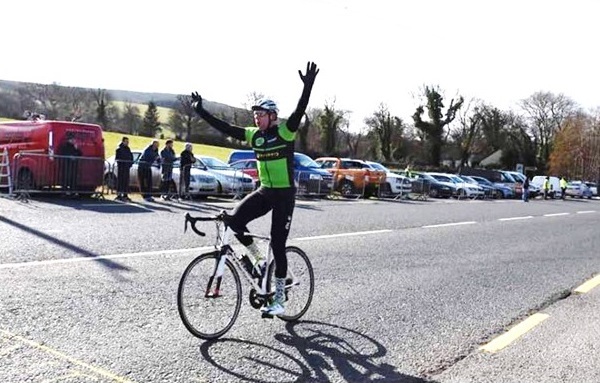 A fourth place finish at the Spires GP was followed by a first place at the St Patrick’s Day Road Race. My Orbea Orca was bought in the sales for £1400 and I raced on Fulcrum 5s, which are basically bombproof training wheels. Costing £170 they’ve done at least 5,000 miles. When you’re young and stupid, you think you can achieve things on your own. Then, life teaches you differently. When you’re older, and if you have the good fortune to achieve anything, you realise that success is wholly dependent on the family and friends around you. There is no way I could have achieved my ambition of winning a bike race were it not for the support of my wife, Siân. Moreover, this was a particularly harsh winter and there were many weekend mornings when I could happily have remained in bed. If I didn’t have so many training partners, there is no doubt, that on numerous occasions I would have put the covers back over my head. The fact that I always had someone to train with meant I never missed a weekend bike ride. Better again, the support of equally committed friends meant we managed to complete what we called ‘six-pointer’ training rides when other cyclists were confined indoors. Beyond training rides with friends, I was also able to join the Carn Wheeler Race Group and the Saturday morning chain-gang that was run by Chris McCann, owner of Inspired Cycling. Any newcomer to bike racing, who harbours ambitions of success, is being seriously deluded if they think it can be achieved as a solo project. Before embarking on a sustained training regime, married men with children are strongly advised to sit down for round table discussions. The best training plan known to man is worthless if you don’t have the time to do it. The best training plan is the one you can do. Establish how many hours you can train, and work from that starting point. You’ll need the support of your spouse. You’ll also need a retinue of training partners. You’ll need their support, friendship and company. You’ll also need their taunts and abuse. If you examine the photograph in the centre of the montage above, you’ll note there is Hi-Viz dot in the background. That weary cyclist is me, dropped during a training ride in the Glens of Antrim. The photograph was taken to poke fun at me on a WhatsApp Group. That’s friends for you. But to win races, that’s maybe the type of friends you need! Paddy Heaney owns the Train Station gym in Maghera. For any queries about personal training, nutrition plans or cycling coaching, please contact Siân on: 07483 998 724.